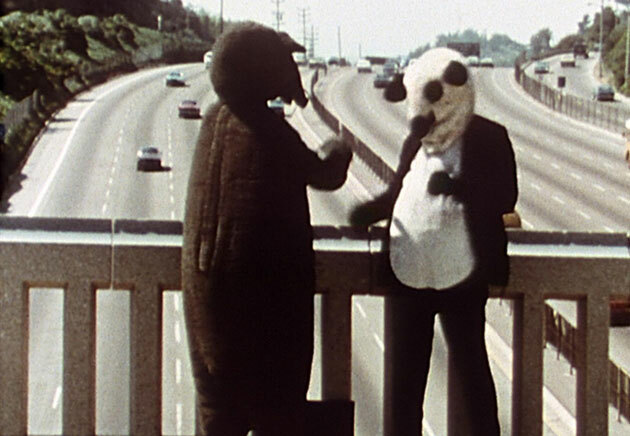 THE POINT OF LEAST RESISTANCE is Fischli and Weiss' first film together. A rat and a bear are out to make a lot of money in the Los Angeles art world. So when they find a corpse in a gallery, hoping it will be the means to enter the worlds of culture, action and finance, they take it with them. However the desired effect is not forthcoming and they become involved in questions and observations on the subject of art and crime. The rat tries to solve the case himself; to him there is no distinction between artist and detective. After a narrow escape from a murder attempt, the two animals join forces once again and, now sadder and wiser, they resolve to improve - something that appears to be far from easy. But at the depths of despair they discover a system of order in the chaos of the world. And from here, they proceed into undreamed-of insights, and flights of fancy. Two artists in rat and bear costumes try to find reasons for all they see and experience, getting closer than expected to the right way.